Blake Cochrane overcame multiple congenital limb deficiencies affecting his hands and his feet to represent Australia at three Paralympic Games. His parents had enrolled him in swimming in an effort to alleviate his asthma, but Blake’s natural ability soon became clear to them at club-level meets and school carnivals. A late call-up to the 2008 Paralympic Games in Beijing saw him compete in the 100m backstroke S8 heats and be awarded a silver medal in the 100m breaststroke SB7 event. He cites his selection for the team and unexpected triumph as the greatest moments of his career. Blake established himself as a Paralympic gold medal contender at the 2011 Pan Pacific Para-Swimming Championships in Edmonton, Canada, where he set a new world record in the 100m breaststroke final and was awarded four other gold medals in breaststroke, freestyle, individual medley and relay. Blake travelled to London in 2012 to attend his second Paralympic Games. He placed 6th in the 50m freestyle, 7th in the 200m individual medley, 8th in the 100m freestyle, and set a Paralympic record in the 4x100m freestyle 34 points and a world record in the 100m breaststroke final. Blake built on his success when he achieved a bronze medal in the 200m individual medley at the 2014 Commonwealth Games in Glasgow, Scotland, and again when he was awarded gold medals in the 100m breaststroke, 200m individual medley and 4x100m freestyle relay at the Pan Pacific Para-Swimming Championships in California, USA, in August that year. Competing at his third Paralympic Games in Rio, Blake was the defending champion going into the 100m breaststroke SB7. Although he wasn’t able to take out the title, he took his silver medal win in stride, saying it was one of the most thrilling races of his career. The Scarborough local is also a talented sportsman outside the pool. 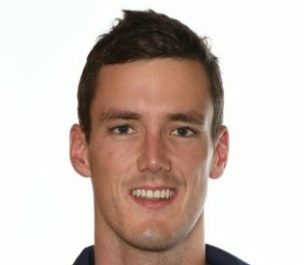 He played soccer as a striker and goalie for over ten years, represented Southern Cross Catholic College on a Gaelic Football tour to Ireland, and enjoys free diving, scuba diving and skiing. Blake recently completed a degree in sport and exercise science at the University of the Sunshine Coast, Queensland, and hopes to use this qualification to become a sports scientist or PE teacher. Blake thrives on motivating others and uses his sense of humour to offer the Australian Para-swimming squad moments of respite during training and competition.